Designing the inside of your pool should not be taken lightly; a visually engaging pool interior can pave the way for a unique and creative outdoor area. It’s essential to select materials that will stand the test of time and look beautiful for years to come. Also, it’s important to consider all of the other design elements in your outdoor space to ensure a harmonious result. 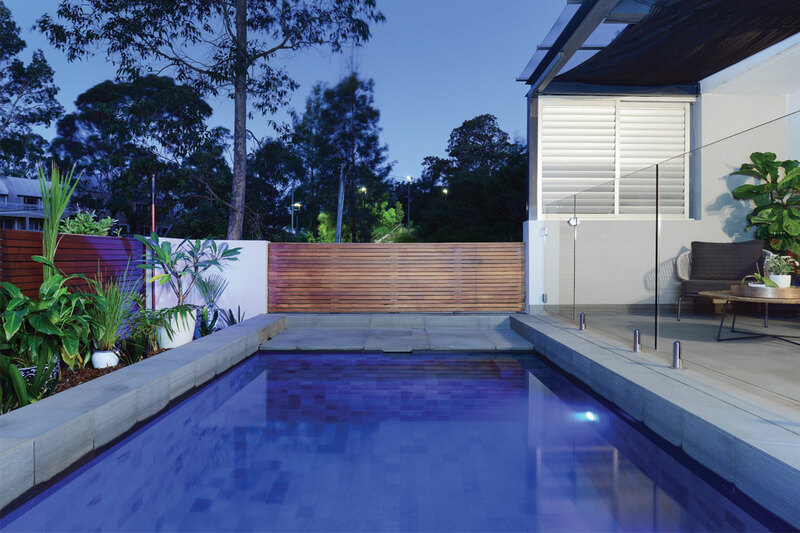 Your pool’s colour, lighting and materials will each have a significant impact on the atmosphere of your outdoor space. You need to be sure your selections not only suit the design of your pool, but also the surrounding landscape. Zeb Rodrigues recommends a fully tiled interior for a concrete pool. “Tiles are more resistant to UV, heat and cold damage than any other pool interior,” he says. 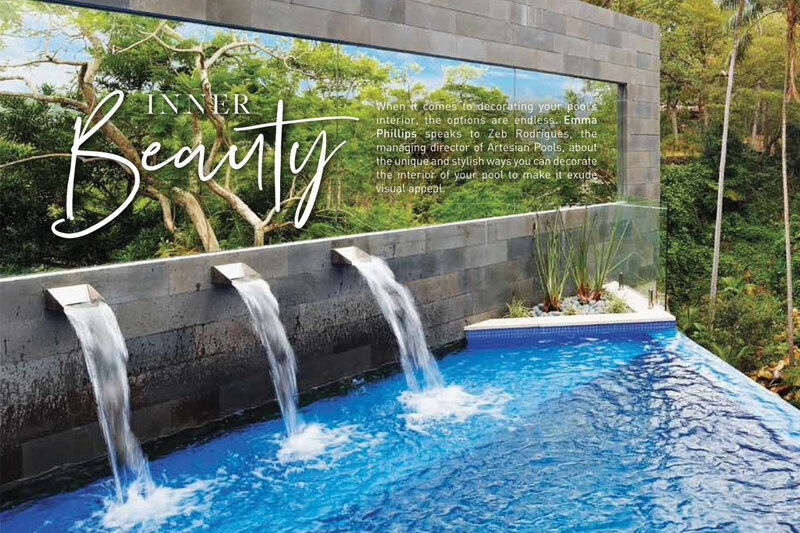 “They will not fade and are versatile when creating features such as waterline borders, murals and gradient colour schemes.” Tiles are perfect for creating unique pool interiors as the options are endless. You can select a shimmering tile to make your pool glisten in the sunlight, or choose a dark tile to give the water a mysterious and edgy finish. Remember, your tile choice will set the tone for not only your pool, but your entire backyard space. Lighting can impact the way your pool looks in many different circumstances. Whether you want to light up the entry steps for safety and convenience, or create a beautifully illuminated oasis at night, choosing the correct lighting is key. “LED lighting is best suited for underwater applications,” says Rodrigues. “It’s brighter and more vibrant, and will illuminate the water easily and last a long time. LED lights are available ina range of different colours that can make your pool a stand-out feature at night.” Coloured LED lighting is also a great, statementmaking option for illuminating your pool’s surrounds, as well as highlighting your garden, pathways and water features. Waterline tiles can change the entire look of your pool and alter the perceived colour of the water. “[They can] add a contrasting border to the pool interior or coping,” Rodrigues says. “They can be used to reflect the light in dark areas or even [subtly] illuminate the pool at night if you select a style with a neon glow.” Large pool tiles will create an eye-catching and modern effect. Rodrigues also suggests using the same stone as the coping along the waterline for a contemporary uniform appearance. Beyond tiles, a pool’s aesthetic appeal can be improved in all kinds of ways. Incorporating an infinity edge is a fantastic way to create a stylish feature, while mirrors or waterfalls can be utilised for a dramatic aesthetic. “Freeform pools can look fabulous when complemented with natural materials and plants that blend with the surrounding environment,” says Rodrigues. When designing a visually interesting pool interior, think carefully about the overall look you want to achieve. 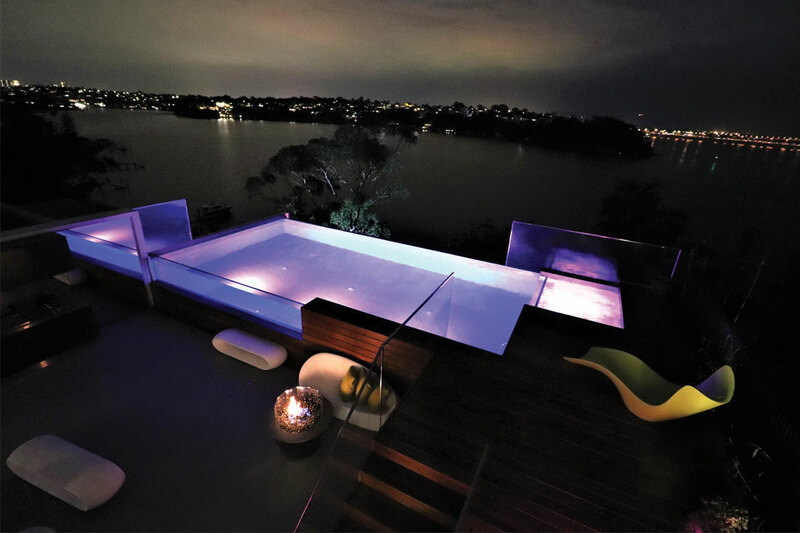 “Your pool interior should create an atmospheric flow from the interior of your home to the exterior,” Rodrigues says. The location of your pool should also influence the design elements you choose to incorporate. If your pool receives ample natural lighting, then your colour choices should accommodate for this. Remember, light colours tend to make spaces appear larger, while darker hues have the opposite effect. 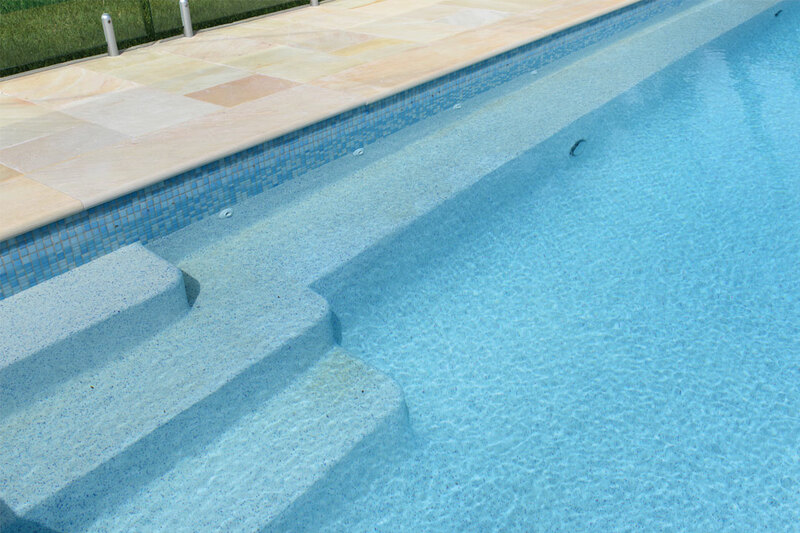 contrasting colour is used for the pool’s coping and surrounds, it can make the water appear deeper and more vibrant.” When it comes to longevity, Rodrigues suggests using quality materials for your pool’s interior. Spending a little more money on well-made materials will ensure a long-lasting effect. “When inferior products are used, even a classic design can look dated due to the poor condition of the finishes,” he says. 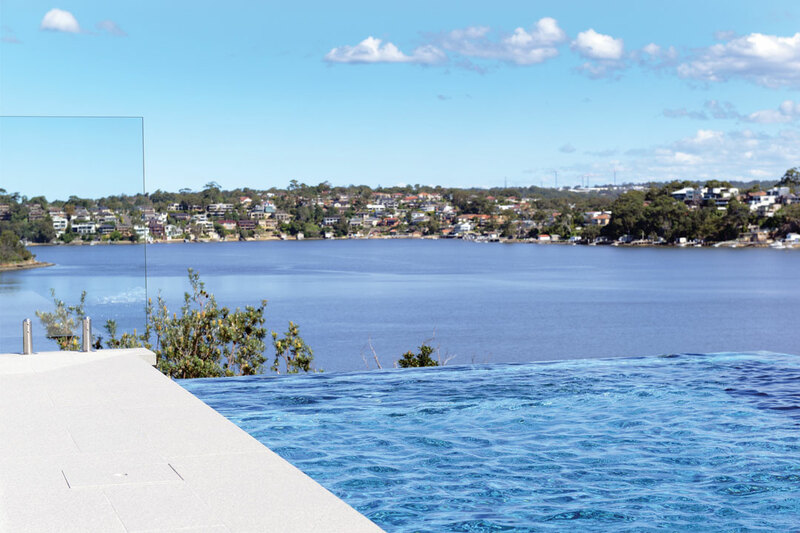 “All products should meet Australian standards, including adhesives and grout.” There are many options available to create a unique and visually interesting pool interior. 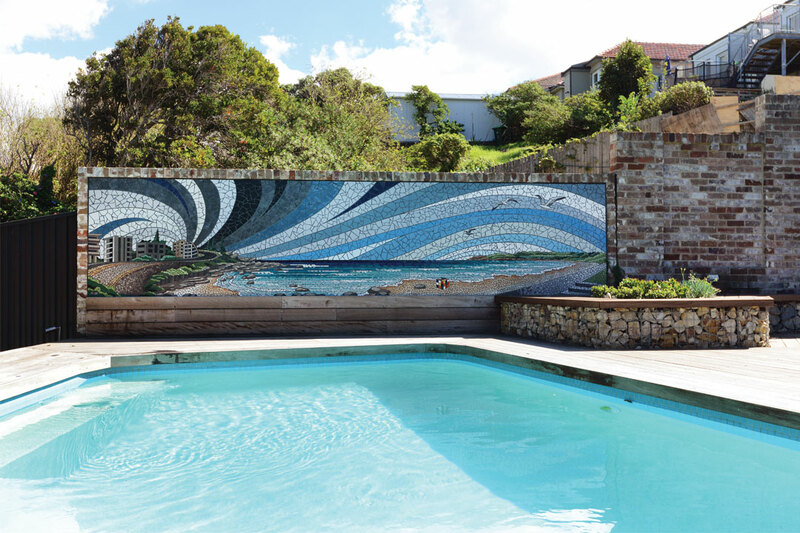 Whether you add a mural display or stunning waterline tiles to your pool, the design should suit your home and personal style. Incorporating a stylish pool interior will add a touch of your personality to your outdoor space, and make it a more enjoyable place in which to relax.